Mr and Mrs S. Samuels. 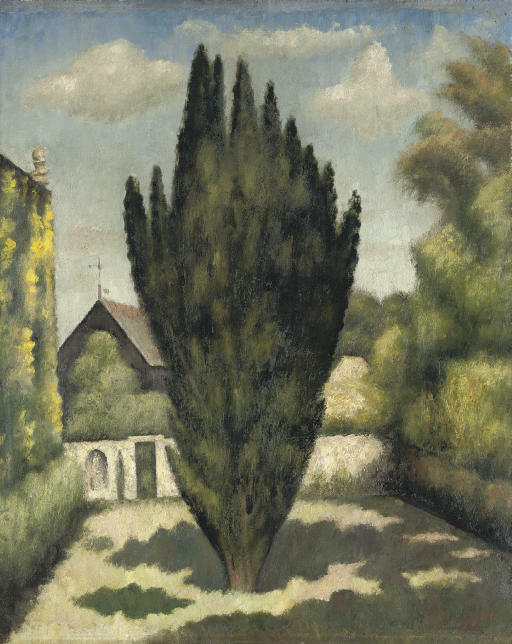 Anonymous sale; Sotheby's, London, 19 July 1967, lot 109, as 'Landscape with Cypress', where purchased by Dunphy. Anonymous Sale; Christie's, London, 19 July 1968, lot 109, as The Yew. J. Woodeson, Mark Gertler Biography of a Painter, London, 1972, p. 374, as 'Landscape with Cypress - Garsington'. London, Goupil Gallery, Mark Gertler A New Series of Paintings, February 1922, no. 17, as 'The Irish Yew'. London, Leicester Galleries, Mark Gertler Memorial Exhibition, May - June 1941, no. 3. London, Ben Uri Gallery, Mark Gertler, 1944, no. 54. London, Whitechapel Gallery, Mark Gertler, 1949, no. 31. We are very grateful to Luke Gertler for his assistance in preparing this catalogue entry.